When someone puts up walls, and you feel as though you should still continue to pursue them there are a few things that you should be mindful of. First, they are putting up these walls for a reason, most likely because they have been hurt in the past, or because they never have let anybody ever overcome these walls. In order to be able to overcome this, one must be patient, kind, and truthful in everything that he or she does. 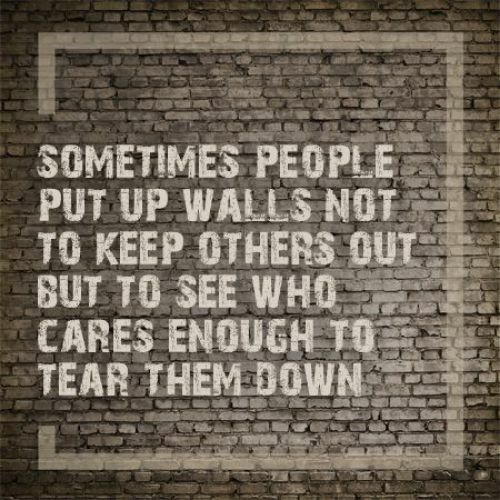 One must show that he or she is trustworthy, and worthy enough for a person to want to take these walls down, showing a person that you truly care is very key in helping someone take walls down. Remember never to rush a person who has walls built up, and if you feel as if the relationship you desire is not moving at a pace in which you want, you do have the option to leave that person alone instead of trying to force them to bring down their walls before they are ready to. This posting is not my own creation collection. My effort is copy paste only. I got it from internet posted by someone else. I’m just saving some time for you to avoid searching everywhere. I’m not violating any copy rights law or not any illegal action which I’m not supposed to do. If anything is against law please notify me so that it can be removed.